The most positive thing I can say about “Downsizing” is that you’ll never be able to guess where it’s headed. Even as the film hit the homestretch, I kept waiting for that “a-ha” moment or the singular statement that the movie looked to deliver. I never got that moment and in a way I left the theater in disappoint. But what lingered was uncertainty. Even after weeks of thinking on it, I’m still unsure about the message in “Downsizing” and whether or not it’s a peculiar sci-fi reflection on humanity or a tonal misfire. Environmentalism is at the forefront in the opening minutes as we watch the Norwegians at work in a lab. They’re looking for a solution to the world’s overpopulation crisis. A solution comes in the unlikely form of shrinking. They’ve developed a way to shrink fully-grown humans down to five inches tall. This mean that the tiny humans will produce less waste, take up less space, and use less energy. Thinking long-range, they say in a few centuries they hope that all of humanity is down to a miniature size to help save Planet Earth. Fast forwarding a few years after this scientific breakthrough, we meet Paul (Damon), who’s manages to persuade his wife, Audrey (Kirsten Wiig), to sell their assets and move to one of the biggest downsized communities in America. The pint-sized world, smack dab in the middle of the Arizona desert, presents an opportunity for the lower middle-class couple from Omaha to be millionaires in the miniature world, since you can stretch a dollar farther when your house is the size of Barbie’s Malibu dream home. Of course, not everything goes to plan. 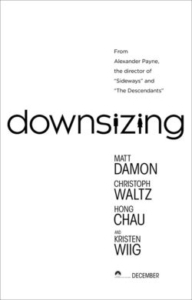 Like I stated at the beginning, “Downsizing” is unpredictable because it manages to take every possible detour away from its original comedic premise of Paul attempting to adapt to his new life in a tiny world. It soon becomes a film about societal constructs, then organized crime amongst elites, then refugees, then class warfare, and then back to environmentalism. There’s the possibility I’m forgetting a few themes that Director and Writer Alexander Payne manages to wring out of his script. It’s a bold, bizarre endeavor that pays off sometimes. But because of the constant gear shifting, there were moments I found myself bored and wondering if I really should get invested in any of the characters introduced, especially with how disposable most are outside of Paul. The sprinkling of humor sometimes keeps the movie grounded in its roots, but when it branches out it pokes you in the eye rather than enlightens. “Downsizing” may be a fun movie to discuss after watching, but that doesn’t necessarily translate into an entertaining film.